The objective of the webinar is to provide an overview of the main decisions adopted during the 2013 COPs & ExCOPs. For the first time in the history of the Basel, Rotterdam and Stockholm conventions, the ordinary and extraordinary meetings of the conferences of the parties were held back-to-back from 28 April to 10 May 2013, in Geneva at the International Conference Centre. These meetings were held together to strengthen the implementation of the three conventions at the national, regional and global levels. Also, having convened these meetings back-to-back allowed for a more effective and coherent decision-making on policy, technical and budget matters, including on joint activities among the conventions and other specific matters. This included the identification of new concrete areas where synergies could be achieved. The objective of the webinar is to provide parties, observers and other stakeholders with an overview of the main decisions adopted during the ordinary and extraordinary meetings of the Conferences of the Parties to the Stockholm, Basel and Rotterdam Conventions that closed their respective meetings on 10 May 2013. In addition, the webinar will introduce the outcome of the high-level segment that took place on 9 and 10 May 2013, where Ministries of the Environment, Agriculture, Health and/or Foreign Affairs joined to discuss synergies among the chemicals and wastes conventions. This webinar session is scheduled to last for two hours. 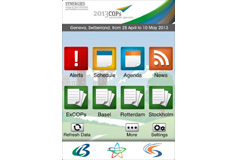 Outcomes of ExCOPs-2 and the simultaneous ordinary sessions of the Basel, Rotterdam and Stockholm conventions - 20 min. Outcomes of the Stockholm Convention COP-6 - 20 min. Questions and Answers - 15 min. Outcomes of Basel Convention COP-11 - 20 min. Outcomes of Rotterdam Convention COP-6 - 20 min. Outcome of the high level segment - 5 min. Questions and Answers – 15 min. Permanent Missions to the UN. The time indicated is based on Geneva local time (UTC/GMT +2 hours). The objective of the webinar is to provide parties, observers and other stakeholders with an overview of the main issues that will be discussed during the upcoming meetings of the conferences of the parties to the Basel, Rotterdam and Stockholm conventions. For the first time in the history of the Basel, Rotterdam and Stockholm conventions, the ordinary and extraordinary meetings of the conferences of the parties will be held back-to-back from 28 April to 10 May 2013, in Geneva at the International Conference Centre. These meetings will be held together to strengthen the implementation of the three conventions at the national, regional and global levels. Also, convening the meetings back-to-back will allow for a more effective and coherent decision-making on policy, technical and budget matters, including on joint activities among the conventions and other specific matters. This will help identifying new concrete areas where synergies could be achieved. The objective of the webinar is to provide parties, observers and other stakeholders with an overview of the main issues that will be discussed during the upcoming meetings of the conferences of the parties to the Basel, Rotterdam and Stockholm conventions. In addition, the webinar will introduce the schedule of work, including the organization of a high-level segment on 9 and 10 May 2013, where Ministries of the Environment, Agriculture, Health and/or Foreign Affairs will join to discuss synergies among the chemicals and wastes conventions. Organisation of work and practical arrangements of the meetings. 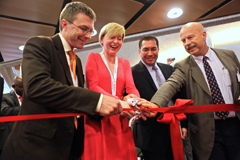 Presentation by the Secretariat of the Basel, Rotterdam and Stockholm conventions: – 30 min. The webinars will be conducted in English. When you register, you will be given additional information regarding the system requirements and instructions on how to log in to the webinar. A briefing to the Permanent Missions in Geneva was held on Friday, 12 April 2013 from 10:00 to 12:00 at the International Environment House II, Geneva, Switzerland. A briefing to the Permanent Missions in Geneva was held on Friday, 11 January 2013 from 10:00 to 12:00 at the International Environment House II, Geneva, Switzerland. A briefing to the Permanent Missions in Geneva was held on Tuesday, 10 July 2012 from 10:00 to 12:00 at the International Environment House II, Geneva, Switzerland. Download the "Organization of the ordinary and extraordinary meetings of the conferences of the parties to the Basel, Rotterdam and Stockholm conventions in 2013" presentation.